I’m releasing Thursday’s cartoon early because of its newsworthiness and because my syndicate’s online division has decided not to release it on its official website. I know that some readers, particularly supporters of John McCain, will be offended by my referencing of a classic 1931 Life magazine photo of an Indiana lynching which shocked the nation. However, I believe it is fair to call McCain, Palin and their campaign for their dangerous tolerance of intolerance among some of their supporters. At a number of their campaign rallies, attendees have shouted comments like “kill him!” and “terrorist!” and “treason!” about Barack Obama. Now, as my readers know, I have been sharply critical of Obama and will continue to criticize him and his policies as I see fit in the future. Furthermore, I am well aware that crazy people show up anywhere and everywhere, and that the McCain-Palin campaign is not responsible for the random hateful comments of some of their supporters. Let me just say categorically I’m proud of the people that come to our rallies. Whenever you get a large rally of 10,000, 15,000, 20,000 people, you’re going to have some fringe people. You know that. I’ve and we’ve always said that that’s not appropriate. But to somehow say that group of young women who said “Military wives for McCain” are somehow saying anything derogatory about you, but anything—and those veterans that wear those hats that say “World War II, Vietnam, Korea, Iraq,” I’m not going to stand for people saying that the people that come to my rallies are anything but the most dedicated, patriotic men and women that are in this nation and they’re great citizens. And I’m not going to stand for somebody saying that because someone yelled something at a rally—there’s a lot of things that have been yelled at your rallies, Senator Obama, that I’m not happy about either. In fact, some T-shirts that are very unacceptable. In other words, says McCain, calling racists to account is tantamount to insulting war veterans. And he dares to compare his supporters’ calls—calls he didn’t speak out against at the time–for Obama’s assassination to T-shirts (he didn’t say what he didn’t like about the shirts). I was only three months old on November 22, 1963, but I am reminded of historical accounts of the hateful atmosphere that had poisoned Dallas before the assassination of John F. Kennedy. McCain and Palin are playing with fire. I am calling them out for their drive to win at any cost—including that of our national soul. Before releasing this cartoon, I searched archives of editorial cartoons to see if anyone else had done anything else similar. Apparently, no one else has. I don’t know why—the idea seemed obvious to me. And it needs to be said. Now let’s see how many newspapers have the guts to print this. The economy has gotten so bad that even racists are voting their economic interests. Polls shopw that white women are moving in droves from Obama to McCain. All you closet Klansmen out there, you would-be Bull O’Connors and George Wallaces, listen up: it is officially time to party! 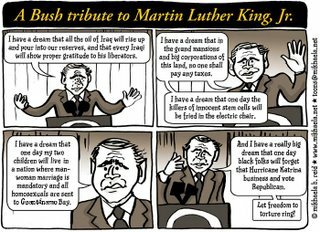 Get out your balloons and confetti, and iron your best white robes, because the Bush Supreme Court has officially declared that racial integration and diversity DON’T MATTER AT ALL. The Bush court says that not only is segregation totally cool (as long as it’s the “natural” result of segregated housing areas), it’s actively RACIST to oppose segregation. Why? Because racial diversity is AGAINST the spirit of Brown vs. Board of Education. Yes, that’s right–it’s against the spirit of the decision that made it possible for children of all colors to go to school together to encourage children of all colors to go to school together. The only way to avoid racism is to DENY it and ignore it and NOT DO ANYTHING TO STOP IT. That’s what being “colorblind” is all about! [Souter] said the chief justice’s invocation of Brown vs. Board of Education was “a cruel irony” when the opinion in fact “rewrites the history of one of this court’s most important decisions” by ignoring the context in which it was issued and the Supreme Court’s subsequent understanding of it to permit voluntary programs of the sort that were now invalidated. I think that school boards are also going to be sensitive to the fact that most parents don’t like it when they are told that where they can send their children to school depends on what color they are. I think the question is whether anyone believes that a politically correct racial and ethnic mix, that kind of diversity, is worth the price of racial discrimination. And I think that most Americans would say that, no, it is not. This [integration] is not about school districts telling people that they can’t go to school on the basis of their skin color. This is about school districts trying to continue to fulfill the promise of Brown and to avoid segregation. In no way is this comparable to the kind of regime of segregation and discrimination that existed under Jim Crow. Prepare to find out. And God Bless Our Colorblind America, where the playing field is level, everyone has an equal chance, and white kids can just learn about colored folks on their Tee-Vees! Next up: The Supreme Court rules that allowing black people and white people to drink from the same water fountains is racist. P.S. 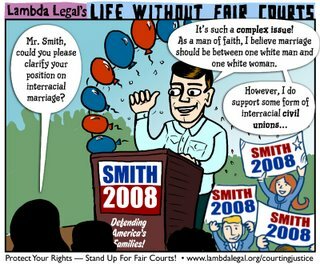 I would have called this cartoon “Separate But Equal: The Sequel”, but I already drew a cartoon with that title. Oh well. P.P.S. 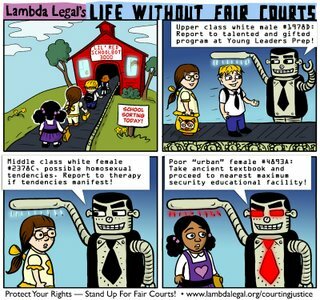 Just so it’s clear–in the cartoon, the kids of color are locked up in a “Jim Crow Max Security Educational Facility” not because they’re troublemakers or deserve to be there, but because they live under racist segregation. You are currently browsing the archives for the race and racism category.